By now, you would have seen the stock image by photographer Antonio Guillem that has shot to internet fame. 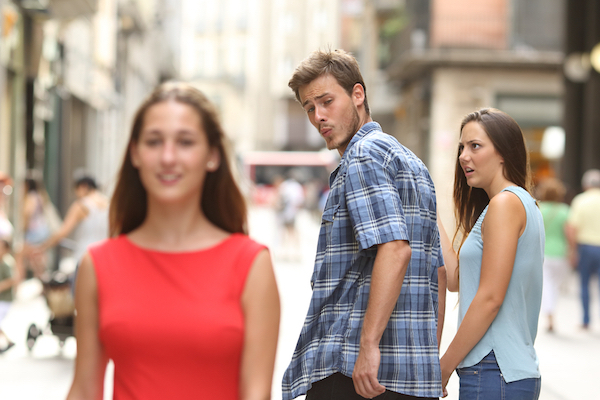 The iconic ‘Distracted Boyfriend’ meme, which features a wandering-eyed man who steals a glance at another woman while his partner stares in disgust, has since been likened to an 18th century painting and Charlie Chaplin footage from 1922. Guillem has snapped several images of the models within the photo, leading internet sleuths to not only find out the entire tragic backstory of the infamous couple, they have also dug out more juicy details about the girlfriend in the meme. Writer Ernie Smith did not know what he was getting into when he decided to learn more about the outraged woman in the picture. While her partner has a notorious reputation for being preoccupied by other females, she seems to have an equal amount of fascination with tech gadgets. “She’s easily shocked when looking at screens,” he discovered. True enough, she’s often shown looking exaggeratingly taken by smartphones and computer screens, like it’s the 1990s again and everyone’s amazed by Apple’s new ‘Macintosh’. If there was a visual interpretation of the idiom, “frozen with shock,” this chain of photos would be it.